Jump into 37-year-old Haun French’s car and immediately you recognise that he is a taxi driver with a difference. It is not just the courteous way he engages his customers, but there is sometimes surprise at the intelligence of his conversations. “I can tell you I was super impressed by him and I just know that there was something more to this guy, but he made one mistake and that has him where he is today,” one of French’s customers told the Sunday Stabroek. 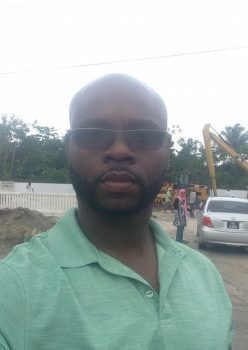 He has been back in Guyana since March 2006 after spending most of his life in the United States, having gone there when he was just eight months old. French is one of the few deportees who quickly acceded to having his name and image published with his story. While many view deportees as all criminals and refuse to give them a chance, he wants people to understand that they are human beings who are just trying to make it in life. Maybe it is because he did not face the many struggles as some others who are returned to Guyana. While he has had his rough days, his family has looked out for him over the years, so much so that when he was deported to Guyana at age 25 his mother had already secured a job for him. Today he has three children and is working seven days a week because when he leaves this earth he wants to at least leave a property his children can inherit. French’s desire to do this may also come from the fact that he has been unable to provide the nuclear home environment for his children as he is separated from his wife, who has two children for him. The other long-term relationship he had, which produced his youngest child, has also collapsed. French remembers the day he was returned to Guyana as if it were yesterday. He also remembers how he came with money in his pocket and how he bribed the police to ensure he did not spend the night in a “stinking cell” at one of the city police stations. Prior to being returned, French had only visited Guyana once in 1992 and his memory of that visit, notwithstanding that he had fun with his cousins, was how badly he wanted to return to the US. French was incarcerated at the age of 21 after a fight and he spent three and a half years behind bars and was deported shortly after he was released. Prior to his incarceration, French said, he had worked in construction, as a substitute teacher at a day care and he had also graduated from the Queens Vocation and Technical High School with a plumbing certificate. He was attending nursing school when his life was turned upside down. As he told it, he was robbed one day by someone he knew and a while later he saw the alleged robber and attacked him. The man had a friend nearby and the friend also joined the fight; French was stabbed to his neck, the scar remains today. He was rushed to the hospital and when interviewed by the police French claimed he did not know the man who attacked him. He received 31 stitches. A year later, French said, he saw the man who had attacked him in a shop and immediately he launched at him. The shopkeeper put them out, but the fight continued outside. “I don’t know, but I blanked out even though I knew what I was doing and I stabbed him several times. He collapsed and I just jumped in my car and drove away and washed myself off. He did not die but he told that police I attacked him. Two days later, I was arrested and that was it,” French told the Sunday Stabroek. He was facing 15 years to life in prison but he took the plea deal that was offered and served three and a half years instead. He knew when he was sentenced that he could be deported at the end of his sentence since while he was a legal resident he was not a citizen of the US. Two immigration lawyers were hired, but according to French “they did nothing.” On his release, he was taken to an immigration centre where he met men who said they were there for years fighting their deportation. “I said no way I am not going to do this and I said deport me. My family knew that this could happen but when it actually happened no one knew. They just come to me one morning and say this is it,” he recalled. He said initially the plan was for him to live with his grandfather in Guyana, but just a few weeks before his deportation his grandfather died. However, he stayed in the family house where he did not have to pay rent and immediately got a job with a huge company working for $7,000 a week. The only bill he had at the time was an electricity bill. They quickly got married and French relocated to Berbice, where he continued to work on the bridge. But things did not work out and while he declined to go into detail, he said that after two children the end came and he was thrown out of the house. By then he was broke, as according to him, he had invested money for his wife to open a business which never materialized. “Look I don’t want to go back there but it just didn’t work out and I had to come back to Georgetown and I had nowhere to live. I had to go over the river and live by a cousin and I even worked as a cane cutter. Cutting cane is not easy and I said that is not for me,” the man revealed. Eventually he was rehired by the company he had worked at initially, but he said while he worked “like a dog” he was not getting anywhere in the company because he had what some described as an argumentative attitude. “But I just would not allow people to talk to me anyhow and that kept me from moving up,” he said. In the process, French struck up another long-term relationship and had a third child but that relationship also did not work out. Eventually, with the support of his father, he purchased a car which he now works as a taxi seven days a week. “Now I am just doing my little taxi thing. I meet people every day and I talk and I learn every day to never give up and I am still trying to get things done,” he said. He said while his family in the US is trying to have him return there and he would go if the opportunity arises, he is not “stressing about it” but rather he is working and living. He knows it is difficult for his family right now, as they would need money to start the process to give him that opportunity. He recalled that initially when he came to Guyana he was conned on a number of occasions and lost a lot of money but now he is wiser. “I have met a lot of people who have been deported, a lot of them waste their time with drugs and alcohol, and I met a lot of people like myself who made the transition and who battling and still trying,” French said. His family still helps from time to time but French said he only calls them when he is at his lowest and they always assist. “I have no friends, everybody knows me but I have no friends. I have been disappointed by friends too many times. People are just a big letdown,” French said before looking at his watch and indicating he was off to make a pick up.